Wego.com.au, the leading travel site in the Asia Pacific and Middle East, today reveals the significance of the colours of the country's approaching Holi Festival (March 12), and why many cities have their own colour code. "India's annual Holi Festival is one of the country's most universally celebrated festivals and an enormous drawcard for international visitors," said Ashwin Jayasankar, General Manager of Wego India. Holi takes place during spring each year with a variety of religious, cultural and mythological associations attributed to the colourful celebration. "Holi means so many different things to everyone, but the festival exudes an intense and electric energy that's uniformly contagious," observed Jayasankar. "There are a number of thoughts about how it all began, but Holi is at its basic a celebration of the colours of spring, of life and love. It's a time to make new friends, celebrate family and neighbours and also amend broken relationships. It's a wonderful time to be in India." The coloured powders, ink or paint each have different meanings. Red symbolises life, festivals and weddings, yellow for prosperity and trade, green celebrates nature, fertility and happiness and blue is the colour of Krishna's skin - peace, love and heaven. 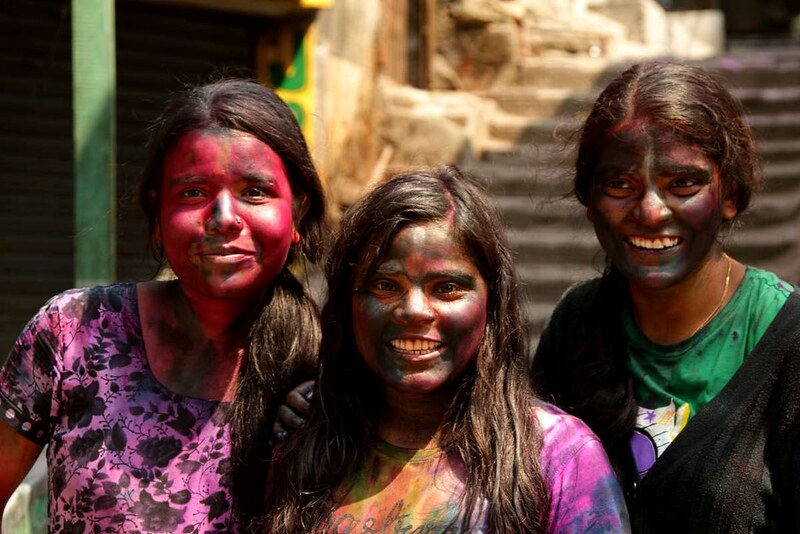 "Each city celebrates Holi a little differently," said Jayasankar. "The most popular cities on Wego are Mathura, for a traditional celebration and Vrindavan for the addition of flowers with your colour. Lathmar Holi is also popular in Barsana where women playfully reenact a Hindu folklore by beating men with sticks, so too are celebrations with children in Shantiniketan, or with the royals in Udaipur. The real community experience with thousands in Delhi or Mumbai are also very popular." While colourful powder is tossed at all those within throwing distance by revellers during Holi, colour is so significant in India that some cities are known by a certain shade in addition to their official name. "India has one of the strongest relationships with colour of any country in the world," explained Jayasankar. "From richly coloured spices, six yards of bright saree, robes for holy men representing their beliefs, and wildly artistic delivery trucks - colour is ingrained in Indian culture." "Many of our cities are colour themed, and each for different reasons," Jayasankar added. "For instance, Nagpur is known as the Orange City due to its large production of oranges, Cuttack (the Silver City) representing its silver industry, and Kolkata gets its Black City moniker from its historical association with the infamous Black Hole prison. Yet others are named for more literal colour associations." Jodhpur is filled with rows and rows of homes painted blue, a shade created by mixing limestone and copper sulphate with water. Beliefs range from the colour selection being attributed to the reflection of heat which sometimes reaches the mid forties, and others say it's representative of the sacred by predominantly Shiva followers. Others say it originated from the dyes created from indigo plantations. In honour of the British Royal visit (Queen Victoria and Lord Albert, Prince Consort) in 1876, Maharaja Ram Singh painted the entire city terracotta pink - a colour representing hospitality. The Maharaja left no stone (or building) unturned with the pink brush. Lord Albert proclaimed Jaipur 'The Pink City' which remains, and the city regularly receives a fresh coat of paint before Diwali. Mother nature has established herself well and truly in Gandhinagar, with an astonishing 53.9 percent green coverage, which is around 416 trees for every 100 people. A relenting sun shines down on the yellow sandstone buildings that fill Jaisalmer giving it an endless golden glow. The city almost disappears into the golden sand dunes of the Thar desert which surrounds it on all sides. The nearby marble quarry was the source of the exquisite stone used to construct the majority of this city steeped in history and romance. Countless lakes break up the city's position on the edge of the desert, Udaipur is a glistening white spectacle, also known as the Venice of the East.